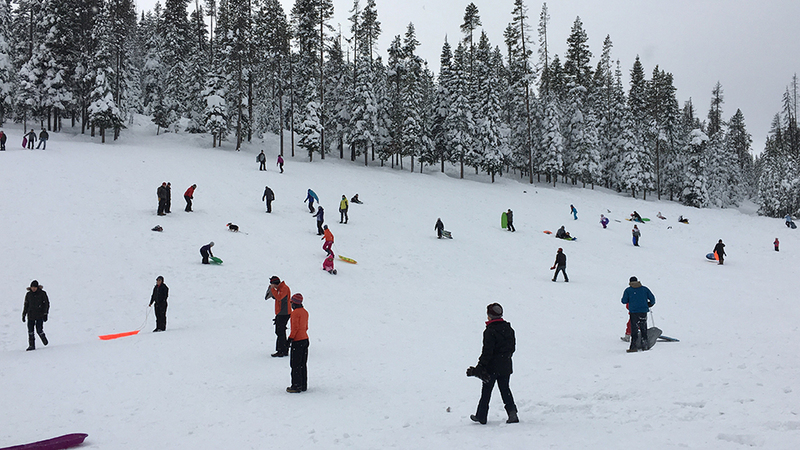 The Wanoga Snow Play Sno-Park about 15 miles west of Bend is on Century Drive on the way to Mt. Bachelor and provides access to both motorized and non-motorized dog-friendly trails, as well as opportunities for sledding and tubing as well as late spring and summer mountain biking. A Sno-Park permit is required November 1- April 30 with the winter season running from December through March. When sledding and tubing, be sure to observe the established sledding safety guidelines and park according to posted directions, as the parking lot was designed for diagonal parking in four rows (two rows each lobe of the lot) with a one-way center travel lane. There is warming shelter that is wired for electricity is in the snow play area next to the restroom (vault toilet), however, there is no water. Dogs are allowed on leash in the sno-park and on the sledding hill, however, snowmobiles are prohibited in the snow play area. For snowmobiling, there is access to over 180 miles of groomed snowmobile trails between Crescent Lake and Santiam Pass, and a warming shelter between Wanoga and Three Creek Sno-Park built and is operated by the Central Oregon Snowbusters and Sisters Sno-Go-Fers snowmobile clubs.